I read aloud, “The main thing to do is pay attention. Pay close attention to everything; notice what no one else notices. Then you'll know what no one else knows, and that's always useful.” I close my book and pause dramatically. Silence. I scan the classroom and search for evidence of deep thinking. Over two dozen students squirm in their seats and riffle the pages of their books nervously. “What is the main character referring to in this passage?” I ask slowly and deliberately. Sure enough, three hands pop up: Claire Bridges, Angelo Chicano and Griffin Benitez. Everyone else sits silently. I’m a humanities teacher. Because one of my passions is nurturing a love of reading in my students, we read at least 2 class novels a year. However, I have consistently found that our full-class discussions around these novels typically involve the active participation of three or four students (That’s less than 10%). I have informally surveyed my students and found that they don’t participate in class discussions for a variety of reasons, ranging from anxiety to variations in learning styles. Over the last four weeks, I’ve tried an alternative to spoken, full-class discussions hoping to ignite the silent majority and create equitable conversations. I call it graffiti discussion. Students may ask a question in order to understand further or push their classmates’ thinking further. Students may answer anyone’s question. They’re encouraged to use the text as evidence to support their response. Students may write about a connection they make with the text. It can be a personal experience or something from another book, movie or TV show. Students can select am important passage from the text that will spark conversation on the white board. Students can make a comment about a question, answer, connection or significant passage. Graffiti discussions take place while students are reading. 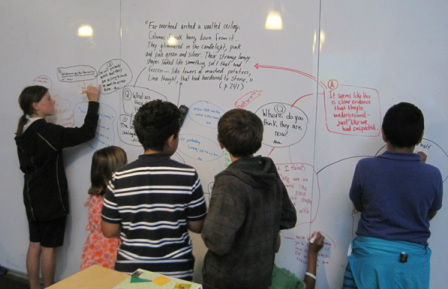 Students write questions, connections, passages and comments in their humanities journal and contribute their most compelling ideas to the white board. In order to assure full participation, I float around the class and plant seeds or encouragement, coaxing reluctant students to share their ideas on the wall. The discussions are like rainstorms. They begin with a quiet drizzle (one or two catalysts) and develop into a massive puddle of ideas within 20-30 minutes. As a conclusion to the graffiti discussions, I have tried three activities (journal reflections on excellent strings of conversation on the board, popcorn share outs and gallery walks followed by share outs). The conclusion never seems to match the excitement or equity of the graffiti discussion. I will continue to experiment with this aspect of the activity. During the height of the discussion, ten to fifteen students actively contributed ideas to our white board (between 30-50% of the class). 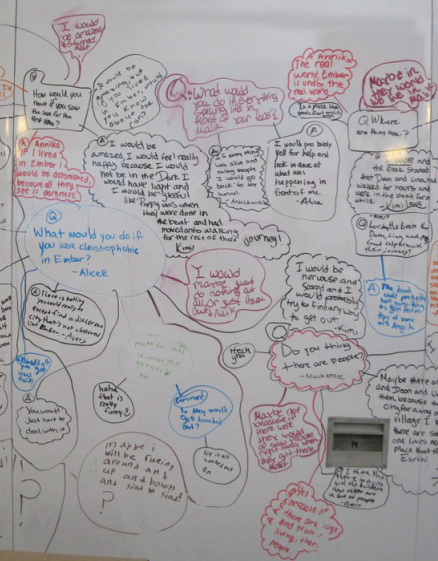 Engagement was heightened by the idea of using expo-markers on the whiteboard. “It’s so much more fun than writing in your journal,” said multiple students. Equally, the activity provides an audience for student writing, which is a motivator for many. Students appreciated the anonymity of the activity. Writing on a board amidst a group of students seems less daunting than raising your hand and speaking in front of the whole class. The nature of the activity activated the interests and strengths of visual, tactile, kinesthetic and social learners. Reluctant and low students were able to read the board, which helped to develop their ideas before contributing (much like a pair share or pre-writing exercise). The low-volume nature of the activity seemed to improve the concentration of students. The activity fostered collaboration and connection between everyone. Q (Question): What are the glowing things in the sky? A (Answer #2): Stars. The book describes them as little specks of light and they looked like salt. Q (Quote) & C (Connection): “He was smiling & crying. She realized she was too.” We took my neighbor to my dad's concert yesterday. She was so excited because she never gets to go out. At the end of the concert she was smiling and crying so much because she was so moved by the music and was thankful for our invitation. Students can participate without fear of being judged. Students enjoy and benefit from reading the ideas that their classmates write. Students enjoy the peer mentorship that takes place during the discussion. One student, Aaron, who reads and writes at a 4th grade level, explained that he benefitted from reading other students’ questions. He perceived the questions of his classmates as hints to help shape his thinking about themes/elements in the book. Previous to this experience, Aaron was reluctant to participate in class discussions didn’t “enjoy sharing his writing with (my) friends.” Aaron said he like sharing his ideas in the graffiti discussion better than just writing in a journal. During the four weeks of graffiti discussions, I invited my 6th grade humanities counterpart, Maria Brandecker, into my classroom to observe the writing my students had generated on the white board. The high level of thinking and deep connections students made in their writing impressed her. Maria and I discussed the benefits of having students engage in these types of equitable discussions. She explained some of the hurdles she was facing in her current class novel activities (similar to those I mentioned on p. 1, paragraph 2). She then used a video I had shot of my students during graffiti discussions, to model the activity for her students. Maria is continuing to use the activity with her students and we’ve enjoyed sharing the results with each other and co-developing further ideas to enhance the activity. She helped me incorporate the idea of citing page numbers along with direct and indirect quotes. We look forward to pursuing further equitable discussion formats throughout the year. It’s so easy to get caught up in the minutia of the day to day. It’s so easy to lose sight of the big picture. This class has reawakened me to issues of equity in my classroom. This typically happens when I’m reading a professional book or taking a class – I view everything I’m doing through a new lens. Over the last month I’ve reevaluated my approaches and looked for evidence of building and supporting equity. I’ve fallen short in many areas, but taken strides to improve. During one of our preliminary classes, Rob Riordan said something to the effect of, We started High Tech High, firstly, as an integration project and secondly a school that does PBL. We always intended the projects to be vehicles for equity – to get students of diverse backgrounds working together. This really resonated with me. The projects had become my primary concern. While examining an upcoming project, I’ve really reconsidered groupings and student choices within the project – opting for more equitable choices. During a conversation with a student-teacher at HTM, I was asked, “How do you apply all of this theory and educational philosophy to your teaching? How do you remember to do it all?” We discussed this at great lengths and eventually formulated a practical strategy. We are both going to make a checklist of the big things we want to do on a daily basis, in every lesson and project and hang it on our walls. Before we plan or do anything, we’ll double-check that list. Of course, equity will be at the top of mine. If you use big ideas as guides and reminders for teaching, they will permeate the fine details of your practice.